In 1963, J. Tuzo Wilson came up with the idea that volcanic chains like the Hawaiian Islands arise when plates migrate over hot spots deep within Earth. Ten years later, W. Jason Morgan took Wilson’s theory a step further when he proposed that hot material rises up from the core-mantle boundary in chimney-like plumes to feed hot spots on the surface. Only now, these theories may crumble under the weight of a few seismometers. Hot vents in Iceland let off a steamy display. Photo by Christina Reed. At three of the world’s most famous hot spots, researchers are independently finding that the heat fueling regional activity is not rising up like a chimney from the deepest mantle. Instead, it may be a shallow phenomenon closely related to lithospheric activity. Scientists working in Iceland found the base of the hot spot feeding Icelandic volcanism extends only about 400 kilometers down into the mantle. In Hawaii, preliminary research shows similar results. Plans are underway for the most extensive seismographic study of the Hawaiian-Emperor chain ever completed. At Yellowstone, seismologists, volcanologists and geologic mappers are coming up with the same conclusion — the long-held assumption that hot spots are fed by deeply-fixed mantle plumes may not be true. In the case of mantle hot spots, teleseismic tomography may end the debate over how hot spots develop. Gillian Foulger of the University of Durham, UK, and Bruce Julian of the U.S. Geological Survey led the Iceland research team as they assembled a seismic monitoring system on the island. They published their findings in the September Geophysical Journal International. As earthquakes occur, seismometers on Iceland pick up acoustical waves traveling through Earth. When a wave travels into an especially hot region, its velocity decreases. They were able to produce an image of the subsurface that revealed a temperature anomaly ending at a mere 400 kilometers into the mantle, ruling out the possibility that a deep mantle plume rising from the core-mantle boundary (2,000 kilometers) causes the volcanic activity in Iceland. “It seems important to me for people to go back and evaluate what we really do know and what is just an assumption,” Julian says. Because the distribution of seismometers was limited to Iceland’s landmass, the only waves that the instruments are able to receive are those approaching Iceland within 30 to 40 degrees of vertical. The narrow range of waves that reach the seismometers impede scientists’ ability to produce a high-resolution picture of what is going on beneath Iceland. More seismometers placed over a larger area broadens the range of seismic waves that can be measured. As more waves are collected over a broader region, the resolution of the 3-D image of the subsurface improves. Orcutt says. By establishing a network of seismometers over a large area of sea floor that will collect data for 15 months, Orcutt believes he will be able to resolve with great accuracy what feeds Hawaiian volcanism. Back on land, some of the folks at Yellowstone are thinking the same thing about what keeps the underground blaze burning. 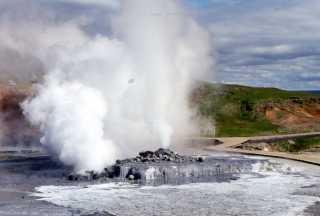 Bob Christiansen of the USGS thinks the Yellowstone hot spot is not related to a deeply fixed plume, but rather to upper-mantle convection related to the regional extension that pervades the northwestern United States. He points out that the hot spot track at Yellowstone runs along what is known to be a major structural boundary in the lithosphere. The Eastern Snake River Plain records the former track of the Yellowstone hot spot, which has been active only since the onset of basin and range extension in the region 15 to 17 million years ago; the hot-spot track marks the northern edge of large-scale regional extension. “There does not appear to be evidence for a deep mantle source,” Christiansen says. Don Anderson of Caltech has spent his career studying Earth’s interior and he notes that the assumptions upon which Wilson and Morgan based their original hot spot theories have been shown to be just that — assumptions. Much of the foundation of their theories have been disproved over recent decades, including the idea that the mantle is isothermal and that all hot material must come from the deepest Earth. “These assumptions were made a long time ago and most never read the original papers,” Anderson says. The basic assumptions behind the plume hypothesis have disappeared and new research is beginning to confirm Anderson’s belief that volcanic activity is controlled by lithospheric motion and extension, not by deep mantle convection or plumes.